“Whatever happened to global warming?” is the title of an article by Paul Hudson that represents a clear departure from the BBC’s fanatical espousal of climate change orthodoxy. The climate change campaigners will go nuts, particularly in the run-up to Copenhagen. So, I suspect, will devout believers inside the BBC. Hudson’s story was not placed very prominently by his colleagues – but a link right at the top of Drudge will have delivered at least a million page views, possibly many more. 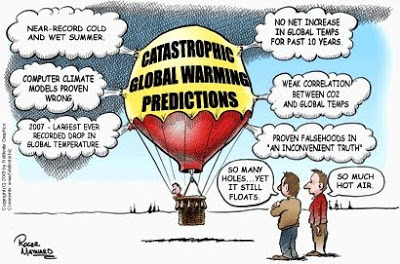 Hudson’s piece is a U-turn – not because he has joined the ranks of sceptics who reject the theory of man-made global warming, but because at last he has written a story about the well-established fact that the earth’s temperature has not risen since 1998, and reports seriously the theories of climatologists (themselves not sceptics) who believe that we are in for 30 years of cooling caused by the falling temperatures of the oceans.